In a year which will mark the 25th anniversary of their last Ulster Senior Football Championship title, Down will commence operations by launching their battle to extricate themselves from the unfamiliar surroundings of Division Three of the Allianz Football League. It's a challenge that the players would understandably prefer not to be facing up to, but a marked decline in the fortunes of a county that has garnered five All-Ireland titles in all - two more than Tyrone and four more than Armagh - now sees the birth of what everyone in Mourne territory hopes will prove a successful rehabilitation process. And if the squad as a whole share a burning desire to return to the more lofty environs of the league, and indeed harbour a raging thirst to regain championship credibility, it is doubtful if anyone can match the intensity of Kevin McKernan in this respect. Three days ago he celebrated his 31st birthday and for the last 12 years he has been the heartbeat of a Mourne side that from time to time promised much but ultimately delivered little. But with new manager Paddy Tally bringing his own effervescent style of leadership and clearly anxious to hit the ground running in what is his first experience as a sole trader in county management terms, McKernan believes that better days could be ahead. "Paddy has come in and already he has made an impression. He is very positive and it's a whole new ball game under his baton," McKernan revealed. "He comes armed with good credentials and I'm very hopeful that he will be able to put the pride back into Down football. 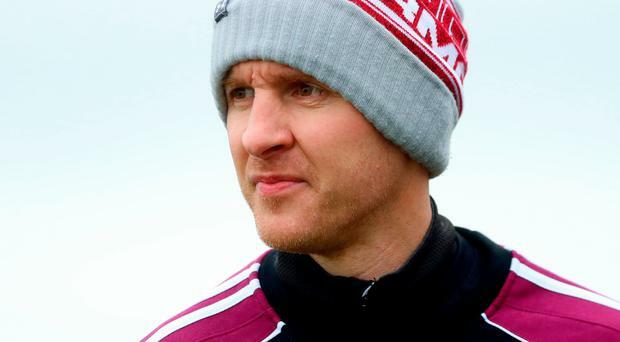 "I was fortunate to be part of the St Mary's squad which he coached to Sigerson Cup success against all the odds, so I am fully aware of his prowess." Down's relegation in the league this year was followed by a chastening Ulster semi-final defeat to eventual champions Donegal, which, in turn, preceded a shattering All-Ireland qualifier reversal against Cavan. It was this sequence of results that expedited the departure of then manager Eamonn Burns and paved the way for Tally's arrival from Galway, where he had played a big part in the team's renaissance under Kevin Walsh. "You would have to say that our fate is always in our own hands," McKernan said. "There are quality players in Down and I think that Paddy Tally can get the best out of them. "He showed what he can do with Galway and hopefully he will help to turn things round for us. He certainly has the ability to do this." As Down focus on what could prove a testing campaign in Division Three, in which teams like Carlow, Longford and Westmeath in particular are expected to pose stiff tests for them, they will surely seek to show an improvement on their home form from this year. It was defeats to Cork and Clare in particular that ultimately consigned Down to relegation and the new management structure will undoubtedly target much better consistency in the promotion drive. Tally's capture of former Down star Benny Coulter as a member of his backroom team is just one of what McKernan sees as several positive features going forward. Coulter proved an invaluable servant to the Mourne county for more than a decade, his spectacular fielding and penchant for plundering goals proving priceless assets. Since calling time on his inter-county career, he has been involved in management at club level with Mayobridge. A full-time coaching officer with the Down GAA board, he has an incisive knowledge of Gaelic games within the county and is passionate about seeing former glories revived. "Benny knows Down football inside out, he is very dedicated to helping to get success and I think he can prove a big help in this connection," insisted McKernan. Down have been drawn in Section A of the Bank of Ireland Dr McKenna Cup in which they will face Donegal, Cavan and Queen's before transferring their attention to the league, where Division Three in particular is expected to be fiercely competitive next season, especially as no side will want to drop into the basement division. McKernan is optimistic Down can rediscover the confidence and cohesion that have been their hallmarks in the past and which were qualities that underpinned their surge into the 2010 All-Ireland final, which they lost to Cork. "I think belief is the key for us," admitted McKernan. "We have to show that want to make headway. It's a big challenge but we will be ready for it." •THREE Bank of Ireland Dr McKenna Cup games have been moved forward to the weekend of December 15/16, a fortnight before the scheduled start of the competition. Fermanagh will meet UUJ in Section C on December 15, with Derry hosting Tyrone in the same group the following day. Armagh, meanwhile, will meet St Mary's University College in Crossmaglen also on Sunday December 16. The three remaining first round games will be played as arranged on December 30. By John Campbell Down face a daunting away assignment against Cork in Division 2 Group 1 of the Littlewoods All-Ireland camogie league at the Cork camogie grounds tomorrow (2.00pm). By John Campbell With the exception of Derry, no Ulster side has been assured of promotion in the Allianz Football League to date. By John Campbell Not for the first time this year, Donal O'Hare proved Down's match-winner at the week-end when his injury-time point sealed a 0-15 to 1-11 triumph over Carlow that not only earned his side two precious points in Division Three of the Allianz League but rendered promotion more a probability than a possibility.